The Quark "X" series have received a powerful upgrade - CREE's latest XM-L emitters! The XM-L puts out even more lumens in a wider area, reducing the tunnel-vision effect from a concentrated hotspot. The Quark Tactical subseries operates with a significantly different UI than the regular Quarks. This UI allows the user to program both primary and secondary outputs. Impact-resistant glass lens with Dual-coating - sapphire coating on the outside and anti-reflective coating on the inside for optimal efficiency and durability. Included accessories: Two AA batteries, lanyard, holster, hand-grip, spare o-rings, instruction manual. Operating your Quark Tactical is simple. Insert the battery with the positive side (+) towards the head. Make sure the head and tailcap are tightened, then depress the tailcap button fully so that it "clicks" and the light turns on. You can also press the tailcap lightly (you don't have to "click" it on) to activate the light momentarily. This is known as the momentary-on feature. 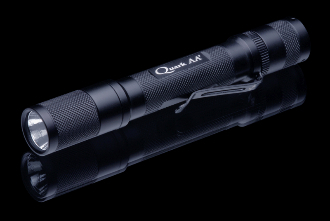 The Quark Tactical can memorize any two modes of output, from its eight total modes, to be instantly available. These two memorized modes are accessed by either tightening or loosening the head (for example, tight can be Max, and loose can be Low). To have your Quark Tactical memorize a different mode, turn it on and loosen the head by a half-turn. Then, tighten the head at least four times rapidly (twisting it tight, then loose, then tight, etc., four times). After the fourth time, leave the head tight or loose depending which position you want to program. Once you find your desired mode, leave that mode on for ten seconds and the light will flash again, confirming that the mode has been memorized. To cancel programming before it flashes, turn the light off for three seconds. 4Sevens warrants its products to be free from defects in materials and workmanship. We will repair or replace, at our option, without charge, any product or part which is found to be defective under normal use and service within 120 months from the date of purchase with proof of purchase. Such repair or replacement shall be the purchaser's sole and exclusive remedy under this warranty. This warranty does not cover normal maintenance and service and does not apply to any products or parts which have been subject to modification, misuse, abuse, negligence, accident, or improper maintenance or repair by anyone other than 4Sevens. Please note: some pictures shown below use the blue tailcap. These lights are sold with the black tactical tailcap.